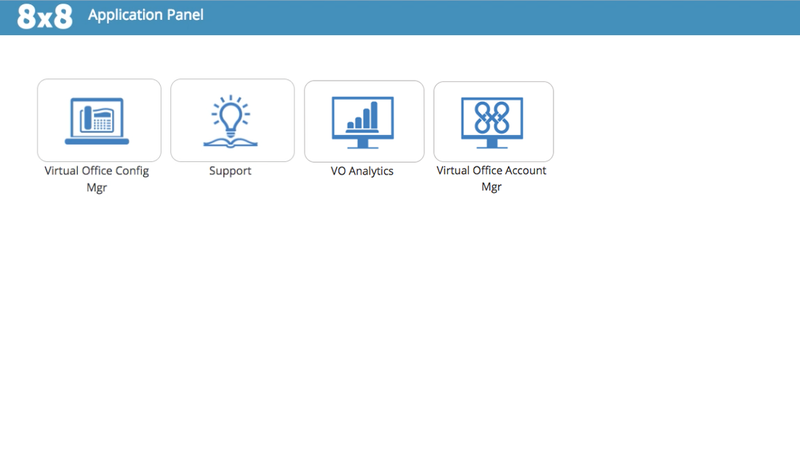 Virtual Office Analytics | 8x8, Inc. The first step for System Admins is to set your user permissions. Once that is configured, users can login by navigating to the 8x8 unified login page. Learn how to navigate within Virtual Office Analytics and basic terminology to help you get up and running analyzing data and running reports. The Company Summary dashboard provides a high-level overview of usage of your business phone system. Using these metrics, you can analyze the inbound and outbound traffic pattern and adjust your business hours to serve your customers. This report provides a detailed summary of call activity for any extension. 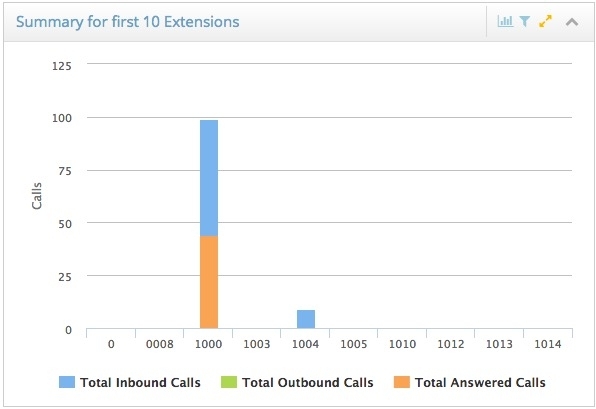 Using this report, you can track the number of answered, abandoned, and missed calls for each extension in the PBX. The Call Detail Records provides historical information about all (inbound and outbound) calls processed in the time frame the user selects. You can track the status of all employees within the PBX in this view. 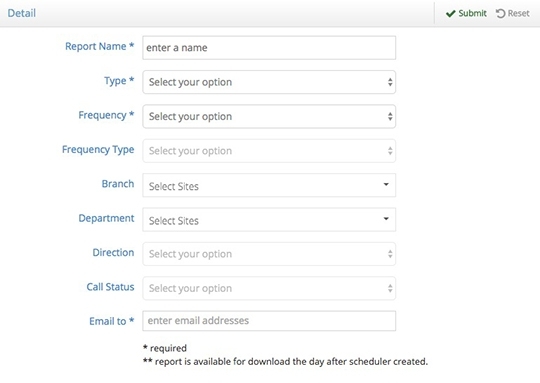 You can schedule reports and receive them via email daily, weekly, or monthly. To schedule or access reports, click on your name in the upper right corner of your browser window. Then select Schedule Reports. This report provides real-time and historical metrics for a call queue such as number of agents waiting to serve the queue, number of calls waiting in the queue, waiting time, number of calls answered so far, and more. This provides a snapshot of critical stats for a queue. Select this option for a quick view of critical metrics for all call queues in the PBX. Select the desired queue for additional stats. The queue detail report provides additional insight about the current status of agents assigned to the queue, breakdown of talk time, number of answered calls, abandoned calls for each agent. 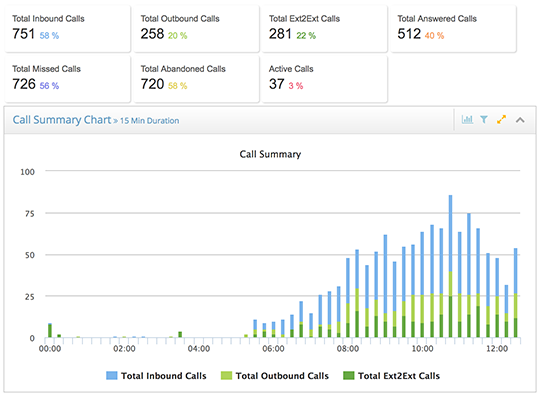 With just a click, you can check out the active calls and calls in the queue. This report captures call details of all calls processed by queues. You can pull these metrics for a desired time period. From the Settings, click Select Dates and select a data range. 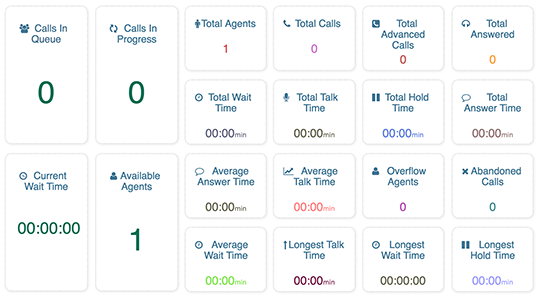 The Ring Group Dashboard provides a real-time view of all call activity in any designated Ring Group. Using these stats, you can monitor performance of agents assigned to the ring group. This report presents call details of all calls processed by ring groups. You can view all attempted calls or filter to view only the answered calls. This report captures call quality of all calls in the PBX over several days or months so the changes in call quality can be tracked. 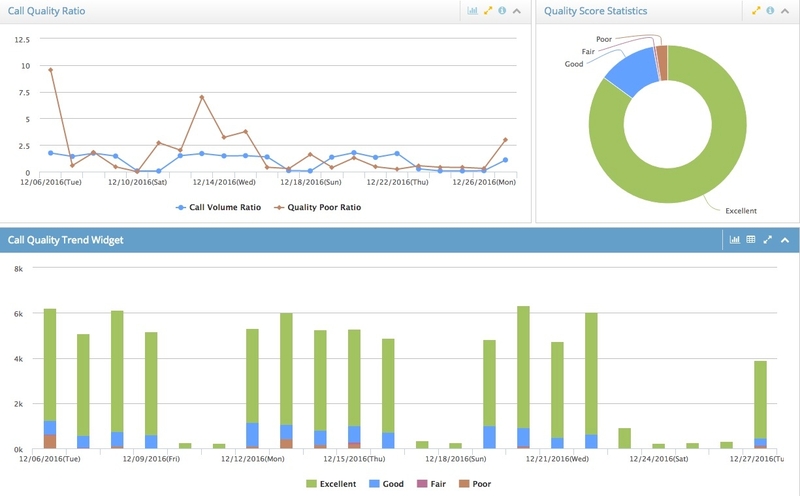 The Call Quality reports offer individual call and consolidated quality score detail in graphical format and granular detail for trouble analysis and resolution. 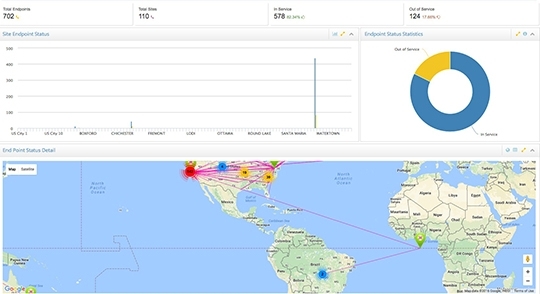 Using this report, you can track devices and employee usage. You can identify network service issues such as those affecting your team during a big storm. The status of devices connected to the network is shown in real time including a geo view of each phone location. It helps you to understand and manage any service disruption before it severely impact the performance.